2 Samuel 7:4 But that same night the word of the Lord came to Nathan: 5 Go and tell my servant David: Thus says the Lord: Are you the one to build me a house to live in? 6 I have not lived in a house since the day I brought up the people of Israel from Egypt to this day, but I have been moving about in a tent and a tabernacle. During his lifetime, Luca della Robbia was said to be among the finest artists of the early Renaissance. Critics continue to hold him in high regard but they are mixed in their appraisal. It is believed he could have grown much more as a sculptor if he had worked only in stone or bronze. Yet his relief work in terra cotta was of such remarkable quality that his name and fame has been linked with it forever. In his “Tabernacle,” della Robbia includes terra cotta alongside marble and bronze, and the figures are surrounded by an architectural frame that is carved in relief and is part of the sculpture itself. The subject of each section is part of the overall trinity theme. The central section of the tabernacle is a lamentation in a lunette made of terra cotta. The figures include an angel with an anguished expression holding up the figure of the crucified Christ. His grieving mother, Mary, is on the left side and St. John with his head bowed is on the right. 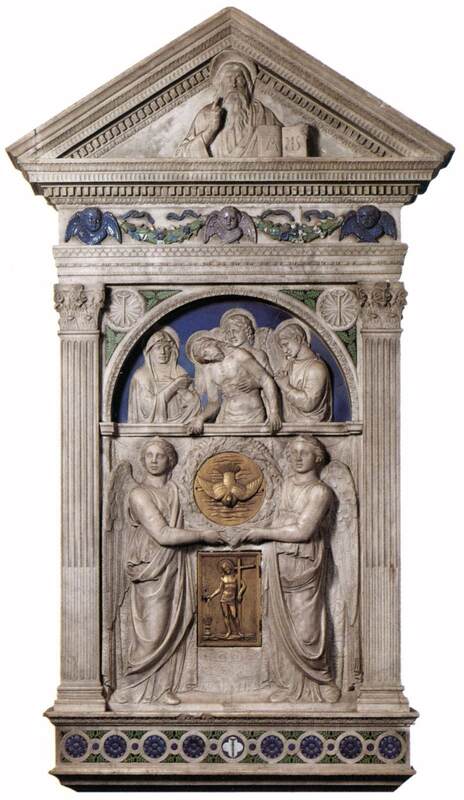 At the time this sculpture was commissioned, della Robbia had been experimenting with clay and glazes and this tabernacle is the first piece in which he used glazed terra cotta. Even after being fired, terra cotta is not as dense as marble; the white glaze that della Robbia formulated and used extensively added hardness to its the surface. He often used blue glaze as a background for the white figures. The lower section of the sculpture is carved in marble and contains two bronze elements within it. The dove, representing the Holy Spirit, was cast in bronze by della Robbia himself. It is surrounded by a laurel wreath that is being held at the top and bottom by an angel on each side. Under the arms of the two angels is a bronze door to the locked tabernacle where the consecrated wine is kept. From a compositional standpoint, the bronze door at this location seems out of place and it is speculated a white door was there originally; this would have allowed the dove to be a central focal point as seems to have been the intent. The door was changed to its present form in the eighteenth century. The relief on the bronze door depicts a standing Christ holding a cross in his left arm. On the floor is a large chalice to receive blood being shed from his right hand. Terra cotta (Italian for “cooked earth”): This is red clay that is hardened by firing in a kiln. It is also used for bricks, pavers, and flower pots. Pediment: This is a gable formed when two roofs meet. In Greek and Roman temples, this triangular area was filled with relief sculpture. Lunette: In architecture, a semicircular opening or surface as under an arch. Lamentation: This is an expanded version of a pieta (Italian for “pity”). In a pieta, only the crucified Christ and his mother Mary are depicted; in a “lamentation,” additional figures are included.